During September 2001, a trial excavation was conducted at Horbat Kosit, along the road leading from Baqa el-Gharbiya to Ma’or (Permit No. A-3499; map ref. 20165–78/70279–83), following the discovery of ancient remains during the installation of communication lines. The excavation, undertaken on behalf of the Israel Antiquities Authority and underwritten by Cellcom Israel Ltd., was directed by E. ‘Awawdy, with the assistance of S. Ya‘aqov-Jam (administration), A. Hajian (surveying), and E. Yannai (pottery reading). Four half squares (C1–C4; Fig. 1) were opened; a mosaic belonging to an industrial installation (possibly a winepress), wall remains and three tombs were exposed. Square C1. Three phases were discerned. A channel (L116; length c. 3 m, inner width 0.17 m) oriented north–south was exposed in Phase 1. It was built of limestone, plastered on the inside and partially covered. The ceramic finds recovered from the channel included body fragments from the Roman, Byzantine and Mamluk periods. 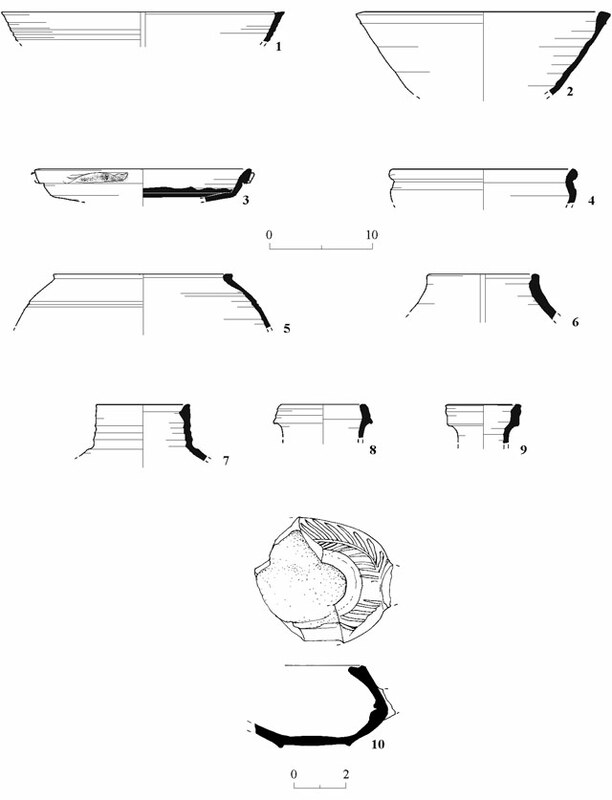 A wall (W1; length 5 m, width 0.8 m) aligned east–west was exposed in Phase 2; the channel had cut across it. The wall was built of two courses of fieldstones, in which ashlars were incorporated. No floors that could be attributed to the wall were found. The ceramic finds (L117) included fragments of bowls (Fig. 2:4) and jars (Fig. 2:6) from the Roman and Byzantine periods. The remains from Phase 3 included a white mosaic surface that sloped to the southeast (L118) and was founded on a layer of tamped earth. The surface was severed by W1 and it seems that it continued beyond the limits of the excavation. The ceramic finds atop the mosaic included body fragments from the Roman and Byzantine periods. A probe cut in the southwestern corner of the square, where the mosaic was not preserved (L119), revealed a layer of fieldstones that probably served as a bedding for the mosaic floor. The pottery from the probe included potsherds that dated to the Byzantine period, among them a jug (Fig. 2:9). Square C2. Remains of a wall (W3; width 0.8 m), aligned east–west and built of two rows of fieldstones, preserved a single course high, were exposed. The ceramic finds included jar fragments that dated to the Roman and Byzantine periods (Fig. 2:8). Square C3. Clusters of fieldstones and ashlars, probably parts of walls that were either robbed or had collapsed, were exposed. In addition, two fragments of a white marble column (diam. 0.25 m, length 0.55 m) were found. The ceramic finds consisted of potsherds from the Roman and Byzantine period, including bowls (Fig. 2:1), a cooking pot (Fig. 2:5) and a jar (Fig. 2:7). Square C4. 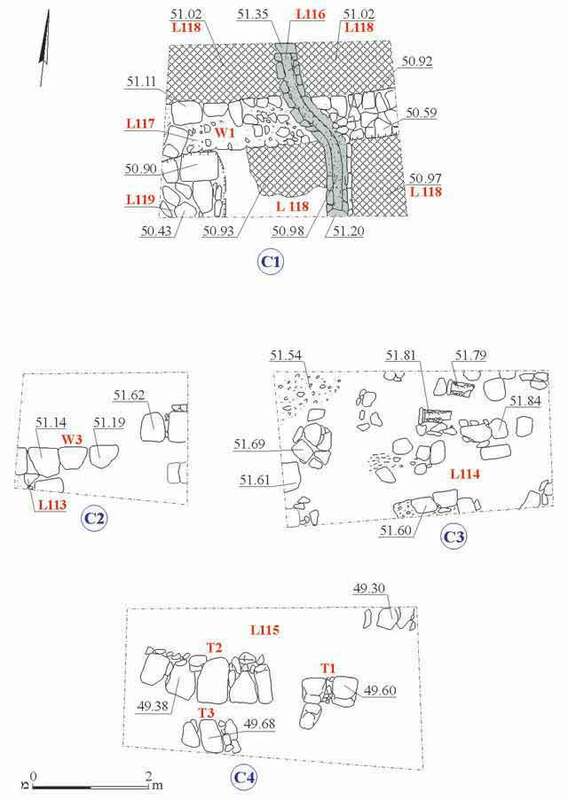 Three tombs (T1–T3), built of fieldstones and oriented east–west, were exposed, but not excavated. The ceramic finds included potsherds dating to the Roman, Byzantine and Mamluk periods, such as bowls (Fig. 2:2, 3) and a lamp (Fig. 2:10).